Oceana Hamilton smiles alongside her teammates. 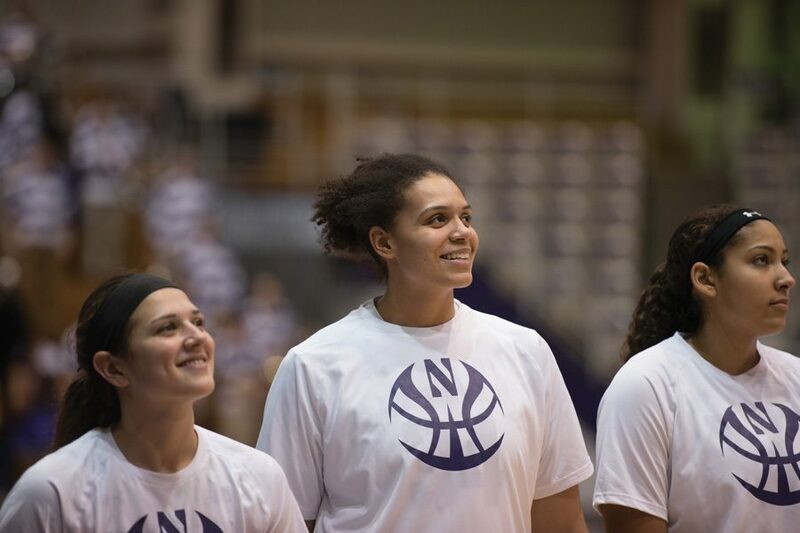 The junior center gave Northwestern a boost on the boards, though the team struggled overall to rebound against Iowa. Midway through the third quarter, Northwestern looked capable of making a push. Iowa’s early offensive rhythm had stalled, and senior forward Nia Coffey was piloting a surge from the Wildcats who, after trailing by double figures for a long stretch, had cut the deficit to as few as 6 points. But momentum flipped shortly after, as NU let a potential offensive rebound slip through its fingers, setting the stage for a Hawkeyes transition bucket that triggered a 10-0 run by the hosts. The Cats (17-9, 6-7 Big Ten) never pulled within single digits again, falling 78-59 on the road. The key Iowa (16-10, 7-6) rebound was one of 51 from the Hawkeyes, who won the battle by a 14-board margin. Plenty went wrong for NU in its fourth-consecutive defeat, but the Cats were thoroughly outmatched on the glass. And once Iowa exploited the visitors’ struggles and dominated in transition — Iowa’s Makenzie Meyer, who scored the tide-turning layup, leaked out on an NU miss moments later and scored the easiest basket of the night — the Cats were effectively finished. Coach Joe McKeown sensed the need for a rebounding spark and called upon sophomore forward Pallas Kunaiyi-Akpanah to save NU on the glass. It was the second-straight game in which the coach gave the sophomore a nod with the team struggling to rebound, and the forward responded with another eight-rebound performance — this time in just eight minutes. Even as Kunaiyi-Akpanah offered stability after Iowa’s big run and again in the fourth quarter, the Cats never made the offensive push necessary to make the game competitive. The Hawkeyes stretched their lead from 13 to as much as 21 once the sophomore was subbed out for the last time in the final period. With Coffey held to a February-low seven rebounds, amid an active effort by the Hawkeyes to keep her out of the paint and prevent second chance opportunities, Kunaiyi-Akpanah provided stability when NU badly needed to slow the hosts’ surging offense. The Cats saw a similar stability during junior center Oceana Hamilton’s brief first-half stint. Hamilton finished with a net-zero plus-minus but posted a positive mark in the first quarter after entering with NU floundering out of the gate. She and Kunaiyi-Akpanah ultimately combined for seven of the team’s 14 offensive rebounds. The Cats’ struggles ran deeper than their rebounding struggles, but the temporary boosts gave the visitors brief windows to convert. Ultimately they never took advantage. The Hawkeyes came away with key rebounds in crucial moments and, eventually, a decisive victory.